According to the legends and history, the St. James Hotel that stands on the once proud and much-trodden “Santa Fe Trail” is one of the most haunted locations in the lands of the one-time Wild West. At the height of its popularity, it was considered a “luxurious” establishment and would host multiple well-known names of their day. These include Billy the Kid, Doc Holliday, Kit Carson, and Pat Garrett to name but a few. When the railroad systems of the United States began to stretch westward, the Santa Fe Trail would become less and less utilized, and the hotel would ultimately decline rapidly. However, the strange stories and accounts within its walls were only just beginning. In the early 1900s, a period would begin of changing owners, none of which would repair the hotel to any satisfactory standard. However, in the 1980s, a buyer would restore it to its previous glory. And what’s more, should you choose to visit the facility and stay there today, you will do so in the surroundings that the guests of the 1880s would. No television, phones, or radios are to be found there. Furthermore, the furniture, beds, and dressers – for the most part – are the original ones that have sat patiently, waiting for life to exist within the walls once again. Before we look at this fascinating building in detail, check out the video below. It features a brief round-up of the hotel as well as some fascinating footage. A Brief History – Famous Names And Brutal Murders! Room 18 – Scene Of A Whiskey-Fueled Late Night Deadly Poker Game! The Claims Of Oz, The Albuquerque Witch! A Fabrication Of Local Legend, Or Genuine Paranormal Activity? The beginnings of the St. James Hotel go back to 1872 when Henry Lambert, a former personal chef of Abraham Lincoln began building what would become “Lambert’s Saloon and Billiard Hall” in Cimarron, New Mexico. He was working as a chef for New Mexico land baron, Lucien Maxwell, having ventured west following his former employer’s assassination. As the new saloon was the last along the Santa Fe Trail it became an almost overnight success, attracting cowboys, miners, and many of those making the journey to the west. In fact, by 1880, the saloon had expanded with the addition of thirty guest rooms. The saloon was renamed the St. James Hotel and it was one of the finest such hotels in the west. According to the record book, a returning guest to Room 14, RH Howard, was actually Jesse James. Wyatt Earp, his brother and their wives would stay in the hotel for several nights on their way to Tombstone and their eventual meeting with Doc Holliday (another famous guest). Buffalo Bill Cody and Annie Oakley would plan much of their Wild West Show while staying in the hotel. Similarly, Lew Wallace would write at least part of “Ben Hur” during his stay there, while Zane Grey would write “Fighting Caravans” there. However, as well as the famous guests there were at least 26 murders that took place within the walls of the St. James Hotel. Furthermore, over 400 bullet holes were discovered in the ceiling of the saloon section during later repairs. Fortunately, and a good insight into Lambert’s planning, three feet of extremely hard wood separated the ceiling from the floor of the guest rooms above and so taking the impact of the bullets as opposed to unsuspecting guests. Twenty-two of those bullet holes remain visible today. It would appear that strange and ghostly activity occurs throughout the entire hotel. And with a past including multiple murders and very likely other unknown disturbing accounts, that shouldn’t come as a surprise. For example, Mary Lambert, the wife of Henry who herself lived in the hotel until her death in December 1926, is said to still reside at the establishment. Many guests and staff members have claimed to suddenly smell her perfume – a particular and unique rose scent – as if she was stood right next to them. Perhaps even spookier are the claims of people who have stayed in what was once her bedroom. Those who have opened the window were all soon subjected to a constant “tapping” on the glass until they shut it. There have also been sightings of what many believe to be the Lamberts’ son, Johnnie, who died aged only two following fatal burns suffered during an accident. People often witness Johnnie in various parts of the hotel. A young boy with “golden curls” wearing a white gown. One particular sighting by an employee cleaning in the bar would result in the witness approaching the boy, who he believed to be a child of one of the guests. When he turned to him, the “child” had horrific burns to his face. He then jumped from the stool and “disappeared into the floor”. Two 12-year-old girls, who records show died of diphtheria at the end of the nineteenth century, also wander the hallways of the hotel. Although their presence might startle guests, they are said to be “polite and well-behaved”. Unlike the “Little Imp”, who steals and moves objects, even making “lamp shades and glasses crack all by themselves”. However, one room, is more active, and more intense, than the rest. 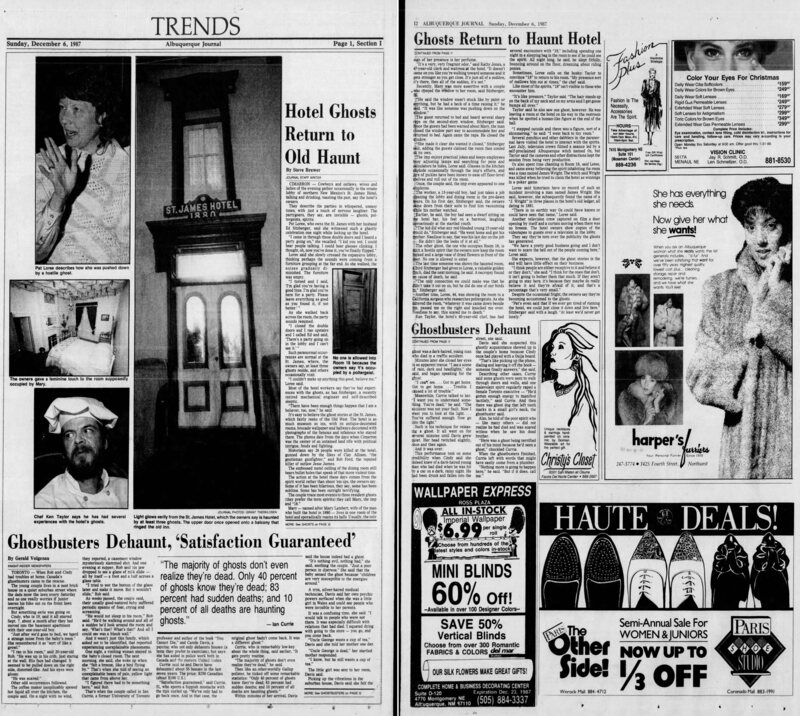 Following the hotel’s reopening in the mid-1980s did the rumors and claims of ghostly sightings and strange activity begin to creep into the public conscious. One particular incident would even lead to the closing off to the public of one of the rooms – Room 18. And what’s more, the stories, including the “real” reason for its sealing off are as intriguing as they are varied. According to the legend, a light night whiskey-fueled poker game in 1881 would result in the poltergeist-like activity that inhibits Room 18 today. The owner of the hotel, believing he had a strong, unbeatable hand would bet the entire hotel on the outcome of the game. Most of the players would fold their hands. One of them, though, Thomas James “TJ” Wright, would remain in the game. He would, according to the story prove to have the better hand. And ultimately, the winner of the contest, and, the hotel. He would “settle up” in the morning. Wright then left the table to go to his room, Room 18, so he could retire for the evening. As he opened the door and stepped inside, he was shot from behind. He staggered into his room, the door shut behind him. He would slowly bleed to death. And perhaps more importantly, would do so before taking charge of the hotel. Several people would initially stay in Room 18 following the reopening in 1986. However, the activity was so “violent” that the owners would eventually seal it off from guests. It remains off-limits today. However, several psychics and investigators have ventured into the room. And what’s more, according to some researchers, the real reason for the sealing it off could be much darker than an “angry ghost”. In late-1987, a self-claimed “witch” from Albuquerque by the name of “Oz” would enter the room to conduct a séance. According to the owners, she would state that one angry spirit was responsible for the disturbing encounters in the room. Those who had stayed there had claimed to see a “human-like figure” out of the corner of their eye. Some would claim to see a “shimmering” to it. Others would feel a sudden, intense “pressure” all around them. According to Oz, the man, James Wright, was killed in the room. Furthermore, she would claim he was the rightful owner of the hotel. And his murder was to prevent him from claiming the establishment as his winnings following a poker game. There are many who believe the “séance” was nothing more than a publicity stunt to increase bookings. The owners and Oz, though, would claim to have had no prior knowledge to the apparent murder of Thomas James Wright. However, according to some local residents, it isn’t a case that the owners are overplaying the hauntings. Local rumor suggests that several “strange deaths” of guests occurred in the room. There was no obvious reason at hand. And not wanting to draw such negative publicity they would make the decision to close the room to the public. They would cite the “violent hauntings” as the reason as opposed to the strange and mysterious deaths. How true these rumors are, themselves now decades old, is perhaps open to debate. Incidentally, there are no official records of all deaths in New Mexico during this time. Mainly as it wasn’t a state at the time of the incident. There is, however, a birth record of a “TJ Wright” in the region in 1859. Furthermore, the guest book at the hotel shows a TJ Wright did stay at the hotel. For three nights in 1881, no less. Of course, this ambiguity allows skeptics to attack the claims of hauntings and violent, angry apparitions. The premises certainly has a rich history. Which was at its peak during one of the most transformative and active times in the (relatively) recent memory of late-nineteenth-century America. Perhaps because of this, many areas are still murky and blurred. Lost or inaccurate records, for example, make it hard to grasp firm, solid proof on the one hand. While on the other, enough partial records and knowledge of the climate of the times exist. This allows us to make a relatively educated guess as to the background of the St. James Hotel. Given what we do know of the events witnessed within the walls of the building, it isn’t a stretch of the imagination or a surprise to hear claims of strange activity and sightings. And even if only one of these is accurate and genuine it would be a major step forward to understanding such strange phenomena. Are these manifestations legitimate evidence of hauntings and activity from beyond the grave? Or might they be a fabrication of real events for notoriety and monetary gain? Check out the video below. It looks at this most mysterious hotel, the most haunted building of the Wild West. The Bone-Chilling And Mysterious Death Of Elisa Lam The Secrets of Room 801 And Britain’s “Lost” 1950s UFO Cases The James Flynn Incident – UFO Over The Florida Everglades Flight 401 And The Ghosts Of Bob Loft And Don Repo The Ghosts Of Pripyat! More Than Just Horrific Memories Of Chernobyl?